A powerful thunderstorm hit parts of the Greater Toronto Area, just hours after Environment Canada issued a warning Thursday afternoon. 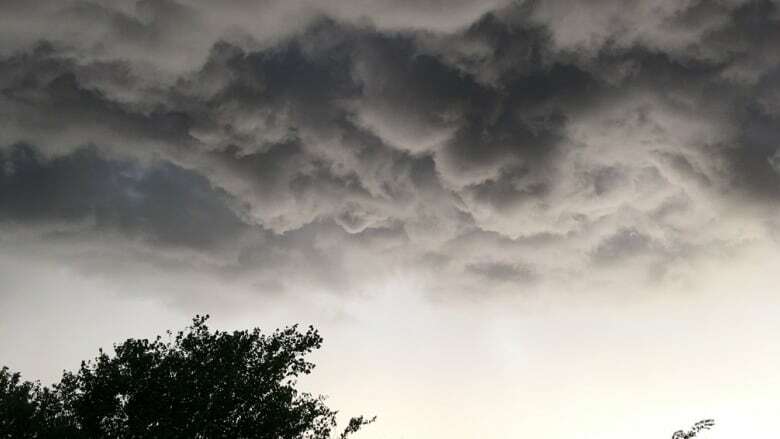 Environment Canada issued a weather advisory saying the conditions are favourable for the development of dangerous thunderstorms that may lead to torrential rain in the Greater Toronto Area and parts of southern Ontario. "Given the high heat and humidity, a few of these thunderstorms could be intense resulting in localized torrential downpours," said the weather statement. The thunderstorm watch is in effect for Toronto, Hamilton, Barrie, York, Durham and more. By 6:30 p.m. ET, parts of the GTA have been hit by the storm. Peel police say they are responding to multiple reports of fallen trees and hydro wires. And the Greater Toronto Airports Authority says the weather is contributing to cancellations at Toronto Pearson International Airport. Flights to Ottawa, Vancouver and Calgary have been delayed or cancelled by Air Canada, WestJet and Delta and other airlines. In a tweet, Pearson told travellers to check departures online before heading to the airport. Additionally, there are reports that thousands are without power. Environment Canada warns some locations could get between 25 to 50 millimetres of rain over a short period of time tonight. And says there have also been reports of wind gusts up to 90 kilometres per hour. Some Torontonians have taken to Twitter to show the storm in their area. Despite the downpour, the extreme heat warning that has been in effect in Toronto will continue into this evening. But Environment Canada says it's expected to cool down by Friday morning with the passage of a cold front.